NOW WITH A MULTIPLE CHOICE QUIZ! 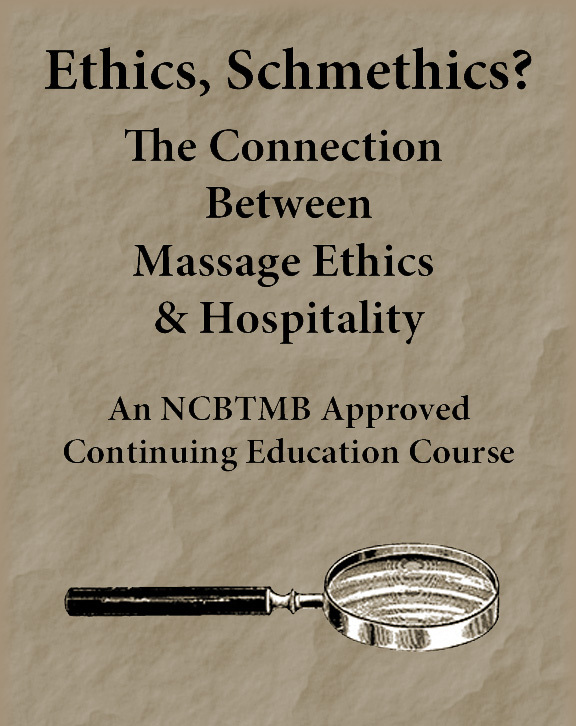 Ethics, Schmethics: The Connection Between Massage Ethics & Hospitality is an NCBTMB approved home study course for massage therapists. This course covers the NCBTMB Standards of Practice, and attempts to do so in a humorous, lighthearted way. Why fulfill your ethics CE requirements while falling asleep over another boring ethics packet when you can read Ethics, Schmethics? CLICK HERE TO PAY. Once your payment and properly completed quiz answers and survey answers are received, we will email a certificate of achievement saved as a PDF to the email address that you provided within 48 hours.